Instructions: Cut Pearl Metallic Cardstock 10” x 7”, score at 5” on the long side to create a 5” x 7” side fold card. Cut a piece of glossy cardstock 4 3/4” x 6 3/4”. Cut the Eyelet Oval Die from Metallic White cardstock and cut another plain Oval from the same cardstock. Ink the edges of the pain oval with Wilted Violet ink. Stamp the Fluttering butterfly image on the glossy cardstock randomly using VersMark ink. Sprinkle with WOW Clear Sparkle embossing powder and heat set using the Heat It Tool. 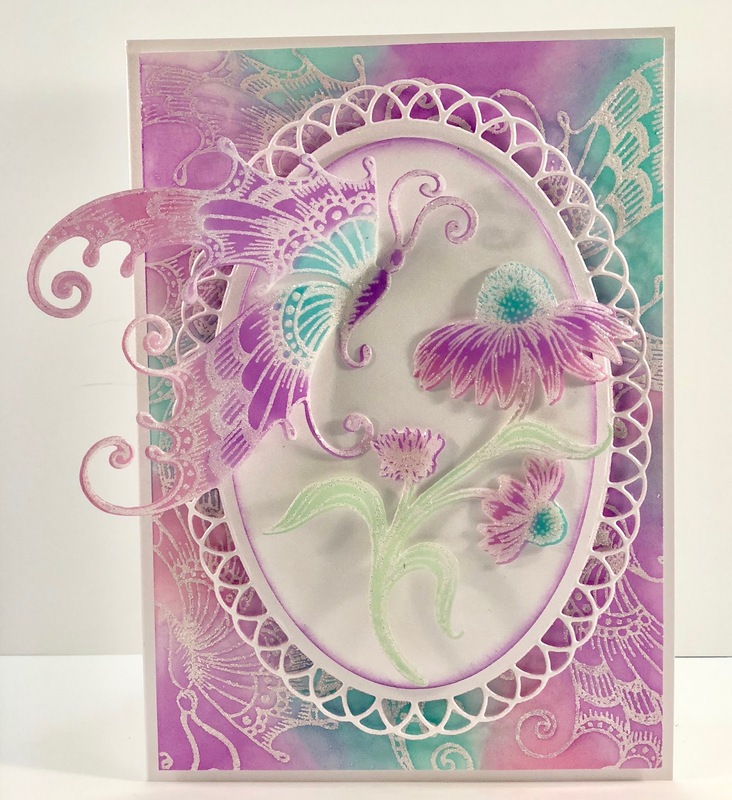 Use the Mini Blending tool and blending foam to ink the cardstock with the Picked Raspberry, Wilted Violet and Peacock Feathers. Use a paper towel to rub the color off of the embossed image. 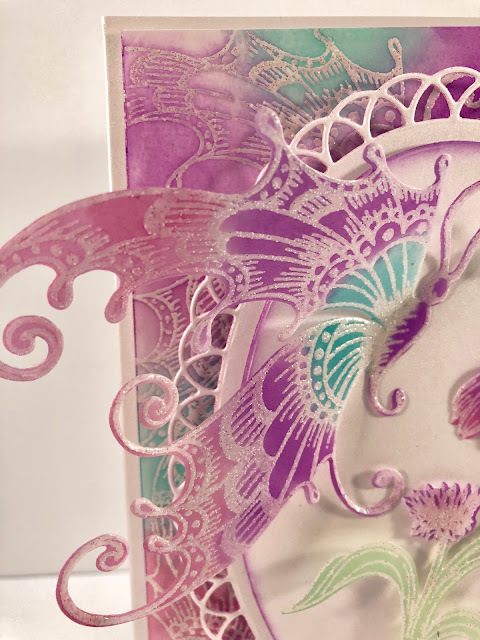 Stamp the Coneflower and the Fluttering butterfly on Papericious Vellum using Frost White ink, sprinkle with WOW Clear Sparkle embossing powder and heat set using the Heat It tool. Color the images with the Wilted Violet, Peacock Feathers, Picked Raspberry and Cracked Pistachio inks. Rub the images with a paper towel to remove the ink from the embossing. Adhere the inked glossy cardstock to the card base using dimensional tape and dries clear adhesive. Adhere the Eyelet Oval using Dimensional tape and dries clear adhesive. Adhere the plain oval in the same manner. 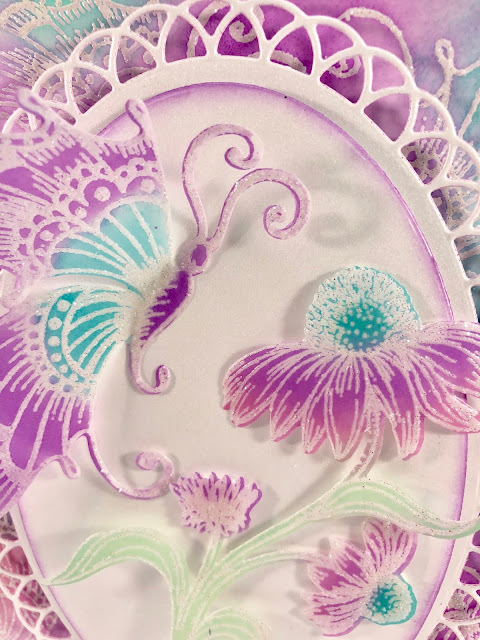 Lightly shape the butterfly and the coneflower using the Deluxe Flower Shaping Kit. Adhere the butterfly by using a little Fast Grab Tacky Glue just on the body of the butterfly. 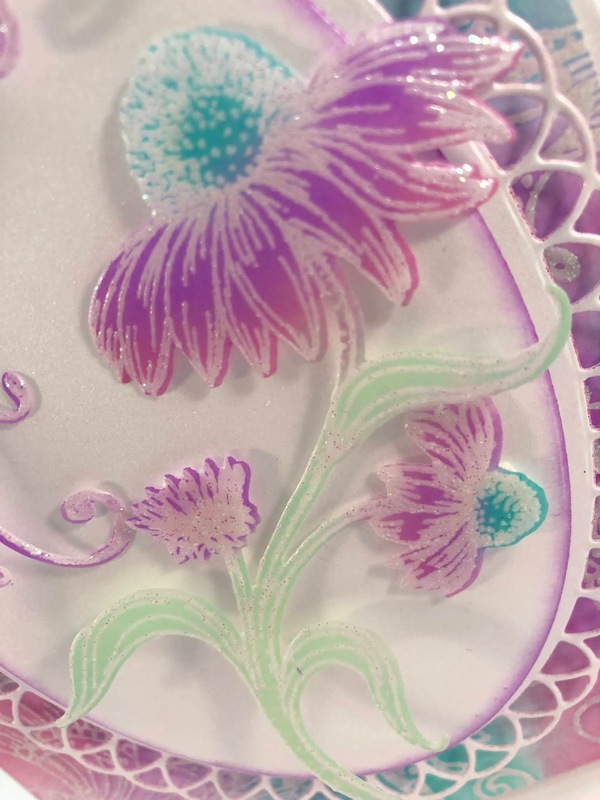 Adhere the coneflower as shown using dimensional dots and dries clear adhesive. Be sure to stop by the Heartfelt Creations Blog to see all of the gorgeous projects created by the oh so talented Design Team. 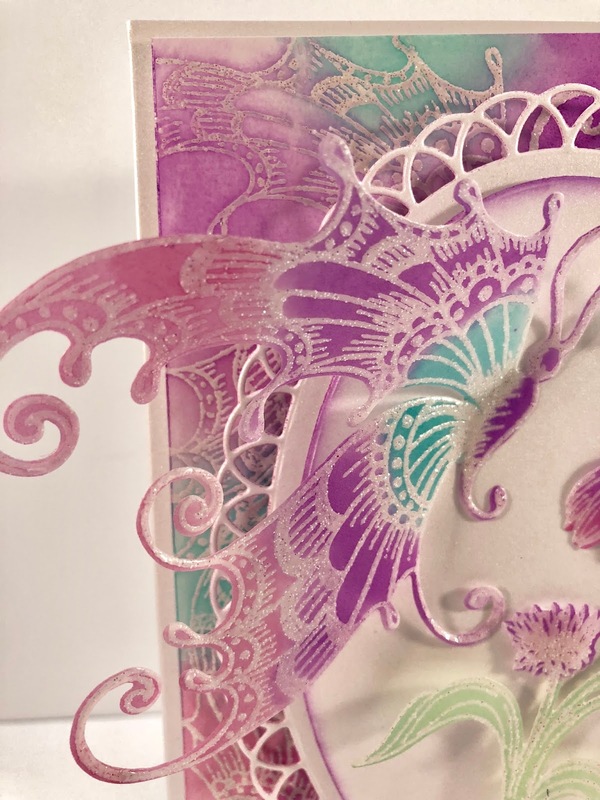 OMGosh Janet, this is the most beautiful card on the blog today!!! I just LOVE purple and turquoise together (I wear that combo all the time!!!). The vellum is gorgeous! Love it my friend! Gorgeous! So beautiful! I love the white embossing on vellum, so delicate!